When you hear the term “Custom Made” or “Tailor Made” a certain thought of exceptional quality comes to mind. You’re filled with the sensation that whatever is being made in this manner will be exactly as you want it to be and it will be the best that it could be. Unfortunately there has always been a premium that comes with such craftsmanship. Many always use the old adage “you get what you pay for” when it comes to premium pricing on premium products. In many instances those people are usually correct. Personally speaking, I wouldn’t want to save money on my mattress or bed comforter nor the safety & reliability of the vehicle I am in that guards my life every day. But that’s me and I would pay what is needed to ensure my happiness. The same could also be applied to specific things like the brake system on a mountain bike, or vitamins & supplements. Cut corners on the brakes and you won’t be cutting many corners on that bike, go for the cheaper and easier found bottle of vitamin C and you’re probably getting artificial colors, fillers, and other toxins when your goal was to help your health. But this is exactly where we turn the tables and do the unthinkable, we offer the premium hand made craftsmanship and we offer it at a price that makes all our custom made suits affordable to anyone. We don’t believe custom made goods are only for the elite, we believe everyone should have the ability to afford custom made suits, shirts, coats, etc. iTailor sets a new standard regarding this concept; we provide an extremely high level of quality craftsmanship with our custom made garments for a price that is simply unmatched across the globe. Every day we receive hundreds of orders for our custom suits, and those suits whether they be linen, our wool blend, chino, or any other suit fabric are made with exacting detail and absolute precision. It’s not enough for us to offer something as revolutionary as custom suits online, we want to continue to be the world’s largest factory-direct custom made clothing brand in the world. We know that through our continued pursuit of excellence, in quality and service, and our philosophy of offering the best price on the internet at the best quality we are continuing to do just that – as testament by our ranking as the World’s Highest Ranked Tailor by Trustpilot.com. Today suits are all over the place; you can find them in store fronts downtown, in department stores, and online. Now in past when people spoke about custom suits it was only because some big shot CEO, movie star, or professional athlete was the subject of the discussion. That’s because custom made suits are commonly known to cost in the thousands when created by great tailors in great cities. That’s where we come in, with nearly 45 years of custom tailoring experience we’ve been suiting the world in custom threads since 1971. Furthermore our company has had one goal since conception; consistently strive to produce the world’s highest quality custom made clothing at the most affordable price around the world. When it comes to our custom suits the story is no different and possibly even more important as men’s custom made suits are one of the world’s most sold custom made goods. Our price is not the only benefit, don’t forget our suits are custom fitted, but they’re also custom designed by Y O U. Our site literally is comprised of millions of different design options from our custom shirts and suits, tuxedos, overcoats, shoes, and more. We believe, if style is personal then why shouldn’t you be able to design your own? So we make certain our sites “design – ability” is second to none with more options than one could imagine. Just like the clothing we make, our pricing truly turns heads and many people can’t even believe the prices our suits go for. In the United States alone you can’t even find a ready-made/off the rack suit for $159, but guess what our entry level suit of the week sells for every single week? We also have 100% cotton chino suits for those looking for a more relaxed and laid back look for only $199. Our newest collection of extremely modern colors and fabrics can be found for only $239, and gentlemen this is a custom, handmade suit, people are going to think you went to NYC to have this thing constructed. Last but certainly not least is my favorite and what any men’s style blogs will tell you is an absolute must have; the timeless three piece suit. These suits range from $269 – $329 depending on the choice of fabric. These are custom three piece suits for less than $500, hell they’re less than $350! Don’t be the last guy on the planet to know us, test us, love us, and spread the word to your friends. Many will wonder how these prices are even possible, the answer is simple; we are the world’s largest factory-direct custom clothing brand. That means the suits are made here and sent directly to you. Every single step is done in–house, the fabric is ours and we cut it precisely to your given measurements. We then fuse it, steam it and press it, pack it, and then off it ships to you. Most businesses have a few other stages in their procedure with other companies, aka “middle-men”, this of course drives up your end cost. We on the other hand sell straight to the buyer. That is what factory direct means and why our price is the lowest guaranteed price for a custom suit and any custom clothing we produce in the world. Why spend thousands when you can spend hundreds for excellent fabric quality, nearly 45 years of knowledge, experience, and master tailors making your tailor made suits! That’s it for this week, if you liked what you read or have any questions please feel free to let us know and comment below! 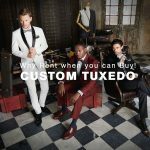 If you’d like to design your own custom suits from nearly 220 fabric options click here and start designing your men’s custom suits today! Don’t forget to subscribe to our newsletter below for free company updates and our weekly sales on men’s custom shirts, suits, luxury designer shoes, and more!